The Law School Admission Test (LSAT) is a standardized test that is designed to measure abilities and skills that are considered key for success in law school. So what exactly is on the LSAT? The LSAT consists of multiple-choice questions divided into five 35 minute sections (only four sections count towards your final score because one section is experimental) in addition to an unscored 35 minute writing sample. The LSAT is scored on a scale from 120-180, with an average score of 153. Here is an overview of the different parts of the test and suggestions for how to absolutely CRUSH each one. This part of the test determines approximately 50% of your total score and is divided into two sections. The logical reasoning sections of the exam are most related to the work of a law student or a lawyer because these questions involve crafting, critiquing, reviewing, and improving arguments. Identifying an assumption in an argument is crucial for success in this segment. The following pattern may be helpful: First, find the conclusion, then find the premises that support the conclusion, and, as a final step, identify any and all gaps and holes in the argument. The LSAT is a carefully constructed exam that deliberately challenges test-takers. Many average-scoring test-takers try to outsmart the test by focusing on predicting the answer choices. However, the test-writers can predict such typical choices, and create answer choices that are similar to the most typical predictions. This makes it impossible to use predictions as a fool-proof tool on the LSAT. Test-takers who achieve a score of 170 or higher tend to know the tricks the LSAT attempts to play on them, and use this knowledge to seek out the wrong answers. Working out the wrong answers to find the right ones seems to be a winning strategy for many. It can save a lot of time, as questions often ask you to find the “best possible” answer rather than the “ideal” one, and the obviously wrong answers can be easily eliminated, leaving more time to figure out which of the strange and not straight-forward answers are correct. The top performers are often good at identifying the core of an argument and utilizing this information to rule out incorrect answers. Logical thinking obviously plays a significant role in mastering these sections. In this section you will face the notorious LSAT logic games. Four logic games must be completed in 35 minutes, allowing for just over eight and a half minutes to complete each game. All the games begin with a scenario that is followed by rules that apply to it. There are normally 3 to 6 constraints, and it is the test-taker’s job to figure out the answers to questions about the scenario. Roughly 50% of the questions in the analytical reasoning section are conditional. This means that they introduce a new rule to the scenario that only applies to that particular question. The remaining questions are based on the scenario and rules alone. There are three main categories of logic games: assignment, ordering, and grouping. To dominate this section of the LSAT, it is absolutely essential to learn the characteristics of each type of game and the diagramming techniques that go with them. The LSAT is notorious for introducing twists to the logic games. Recognizing the different game types is crucial to success, but LSAT logic games aren’t always straightforward. Many of the games mix characteristics from different game types, so test-takers must be flexible and creative in their diagramming and problem-solving skills. Some of the logic games can be solved by using different types of diagrams instead. When it comes to logic games, there are a few important differences between average performers and top performers on the test. The average test-taker either uses diagrams rigidly, or uses a unique approach to each game. Test-takers with top scores tend to use the diagrams flexibly, adapting to twists. Top performers also methodically follow the inference chain, whereas average performing test-takers waste a lot of valuable time with the trial and error approach. Those who do well in this segment tend to find logic games fun and are not intimidated by logic games. Be prepared to think on your feet and use your creative juices when you’re working on this section of the LSAT. Make sure you practice many questions before the exam to prepare yourself for all kinds of logic games. Much like the analytical reasoning section of the LSAT, the reading comprehension consists of four separate parts. Each part is about 60 lines long and divided into 3-4 paragraphs. Five to six related questions follow the passage. This part of the test is divided in four categories: Law, Natural Sciences, Social Sciences, and Humanities. Test-takers aren’t expected to have prior knowledge of any of these fields. The objective of this section is to measure the test-taker’s ability to read with understanding and insight while under time pressure. 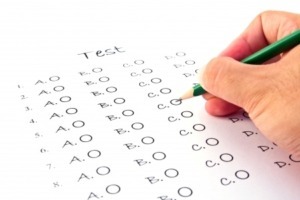 There are many different strategies for this section of the LSAT. Some students try to become faster readers, others read the questions first and then skim the text passages, hoping to find the right answers more quickly. The most successful candidates train for this section by familiarizing themselves with the structure of the text passages on the LSAT as well as the nature of the questions related to the passages. Both speed and the ability to grasp the core underlying framework while separating it from unessential information in the text are at play in this section. The best strategy for this section is to identify the core issue or argument, analyze which details presented in the text support each side, and finally, determine the position of the author. The types of questions in this segment can be divided into three categories: Identification, Inference, and Synthesis. Identification is the most straightforward type, because test-takers need only understand the meaning of the text. The second type, inference, builds on identification and requires the test-taker to seek out the relevant part of the passage and derive other deductions from it. Finally, synthesis questions require the test-taker to take everything one step further by combining several conclusions and constructing a broader understanding of the issues at hand. The writing sample section of the LSAT is not scored. However, these essays are sent to all of the colleges to which students apply. Most test-takers feel a bit uneasy about writing an essay at a moment’s notice on an unknown, unfamiliar subject. The purpose of this test is to assess the test-taker’s ability to construct a compelling argument, demonstrate solid reasoning, and provide supporting evidence. It also measures an individual’s overall ability to express thoughts clearly in written form. The strategy to crush this segment is to keep it simple. Don’t fall into the trap of trying to blow your audience away in your writing sample. You want to demonstrate your ability to construct an argument and support it well. Don’t make it hard for yourself! Essays must be written in 35 minutes, so there isn’t much time to spare. Making a simple table to outline the main pros and cons of your argument should suffice when you are planning your essay. It is also a good idea to leave at least 25 minutes for the writing process. Be sure to use one of the best LSAT courses when you study as this is crucial to scoring high!